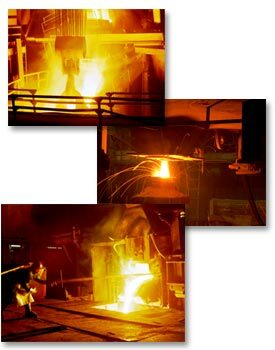 A premium first quality grade scrap insures low residuals and consistent analyses from “heat to heat”. Each scrap source is carefully researched, screened and tested prior to use to guarantee SPC conformance. A computerized Automated Blending System analyses, sorts, and monitors all incoming scrap for the lowest residuals and accurate chemistry aim compositions. Only ferroalloys with certified analyses and low residuals are used. Along with premium scrap, new technology slag refining practices are employed for consistently high quality clean steel with low phosphorus and sulfur levels. Each heat is Argon stirred and vacuum degassed prior to bottom pour ingot teeming. Our unique shrouding practice minimizes stream re-oxidation. Modified high alloy rolls chemistries are Electric Arc Furnace melted using our unique melting and pouring practice. Newly renovated dual tank Stokes vacuum degassing units achieve extremely low hydrogen levels on heat sizes up to 120 metric tons. An ingot mold inventory from 480 to 2135 mm diameter allows us to custom tailor forging reductions to final customer specifications.